I've said it before and I'll say it again: The greed of the American pork industry has messed with the modern day pig to the point that almost all available pork is now so lean it has lost the ability to be tender. That said, there are a handful of distributors of free-range pork, among them Pendleton Farms, a brand carried by the Co-op and Eureka Natural Foods. Once in a while we find a couple of well-marbled pork chops that I cook more or less following the recipe for "Julia Child's Sautéed Pork Chops" (from Julia & Jacques Cooking At Home), but most pork is far too dry to cook traditionally. Not long ago, Cook's Magazine's Bridget Lancaster addressed the problem: "Dry, tough pork chops are the reality," she says. "My dream was juicy, tender pork chops in 20 minutes." It's her basic method I'm advocating here. The good news is, it works; the bad news is, you need a meat thermometer, preferably one that reads instantly. (Hensel's Ace Hardware's new kitchenware department in Arcata has several choices.) This recipe gets a boost from F Street Café chef Dan McHugh, who added apples and Dijon mustard. 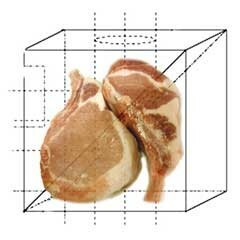 First, you need bone-in chops -- boneless cook up too dry. Also, thicker is better -- 5/8 to 1 inch. Spray a sauté pan large enough to hold all four chops comfortably with Crisco and put on the stove, but do not pre-heat. Rinse the meat, then dry it thoroughly and put it on a large plate or platter. Cut eighth-inch vertical slits in the surrounding fat about every two inches (to keep the chops from buckling during cooking). Butter the top of each slice, and sprinkle with sugar, then spices (I use dry dill, curry powder, granulated garlic and onion, coriander, and finally salt and pepper). Press seasonings into the meat so the butter creates a paste. Now turn each chop and do the same thing. Some butter/spice will stick to the plate. Not a problem. Place the chops in the cold sauté pan, pressing the meat so the metal is touching as much surface as possible. It's best to turn the bone sides toward the center. Now turn the burner on medium. (After about 2 minutes, you should hear a gentle sizzle; if not, slightly increase heat.) Cook uncovered until lightly browned, usually 4-6 minutes. Turn the chops, cover the pan, and reduce heat to medium-low. Cook another 4 minutes, then test near the bone with the meat thermometer (it may take several more minutes to reach temperature, so check frequently). When it reads 140, remove the chops and place side-by-side in a warmed, shallow ovenware casserole, and cover. Do not discard pan juices. Raise pan to medium-high heat, and add diced shallots and 1-2 tablespoons butter. After a minute, add the apple slices, toss to coat with juices, then add the sauterne, mustard, and herbs. Lower the heat to let the apple cook slightly. (If using cream, add it now, and stir everything around.) The sauce should reduce to a slightly syrupy consistency. Pour the pan mixture over the chops and cover. Serve immediately or set aside, if desired, to be warmed in the microwave. Chef Dan garnished his chops with roasted half Brussels sprouts, a bittersweet flavor to counter the tangy-rich pork. The sauce can be changed to fit your menu: less sweet: capers, pimientos, and rice vinegar; or sweeter: white raisins (or dates, dried cranberries, candied ginger or orange peel) and sherry or spirits. The key to this method is to begin with a cold pan. I know no easier way to make commodity pork chops edible. Edible, but not really all that desirable. And not just in terms of taste. The food conglomerates contribute enormously to deforestation and global warming. Even if they got the message that consumers want them to employ humane and organic practices, it would mean dramatically less profit for them. Animal welfare and human health? Nothing personal, but it's really about the money. Regardless, commodity factory-farmed meats, for Americans of small-to-moderate means, are the only cheap, easily available, easily cooked, flavorful proteins -- for the time being. As I savor my marvelous pork chop, I realize that we are fortunate to be among the last generations of Homo sapiens who are full-time carnivores. Those that follow will face a rapidly diminishing food supply for a rapidly growing world population. That may not mean total absence of meat as a staple of our diets -- it's too culturally ingrained. Sooner or later, there will be a crunch, but I predict that food science will evolve to meet that problem. Meanwhile, cook and eat a really good pork chop. Tomorrow you could be hit by a tofu delivery truck.